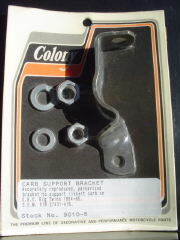 Exact reproduction of the original Harley brackets used to support the Linkert carburetor. OHV Big Twins 1941-1953 Replaces OEM # 27431-41. OHV Big Twins 1954-1965 (Shown in picture). Colony Stock #'s 9009-5 and 9010-5.